If any filmmaker could make me like a movie about the Cold War, Steven Spielberg is the one who could do it. And he did. 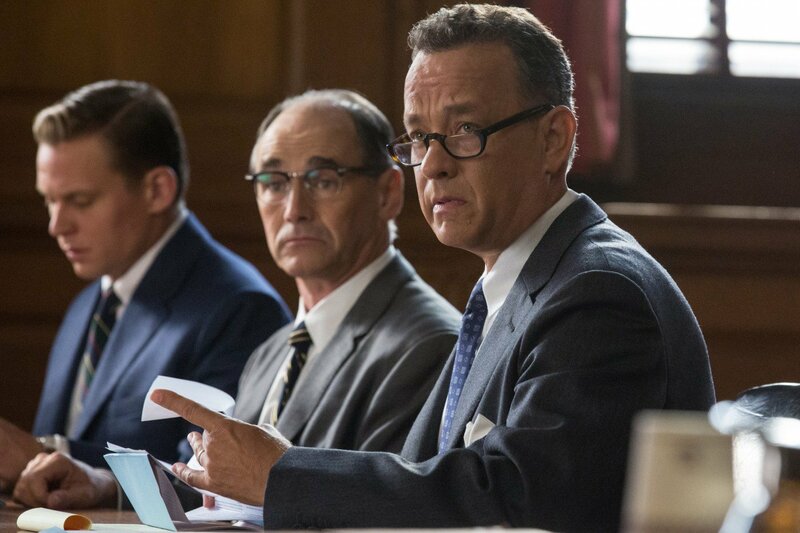 “Bridge of Spies” is a perfectly fine Cold War thriller. It's a film that is competently made and rather entertaining and thankfully leaves out the stuffiness that was so present in “Lincoln” and “War Horse.” Even if Spielberg hasn't made a film that's taken place in modern day since 2005's “War of the Worlds” I'm at least thankful that he's still a master of Hollywood filmmaking. All of his modern Spielbergian touches are there from beams of light in smokey rooms, family dynamics, to impeccably timed moments of cinematic suspense. The only thing here that stands out as something radically different is Thomas Newman's terrific score. At least we know we'll be comforted knowing another composer could easily fill John Williams shoes. “Bridge of Spies” feels like what the dramatic period pieces “War Horse” and “Lincoln” should have been but weren't: flat-out entertaining. I don't know a lot about the Cold War, and not that I want to point the finger of blame, but I never remember getting much beyond World War II in any of my school history classes. The fifties and sixties were a somewhat fascinating and terrifying time in the United States. There was political upheaval eventually but mostly there was a level of fear in the country at the time. Fear of an unseen enemy: communism. People feared Russia and their political ideology. Unfortunately, not much has really changed today. There's still a high level of fear that permeates our society, though the enemy has changed significantly. Spielberg has crafted a glorious recreation of the time period right down to kids being shown how to prepare for a nuclear attack. In “Bridge of Spies” Mark Rylance plays Rudolf Abel who is arrested in Brookyn, New York on suspicions that he's a Russian spy. 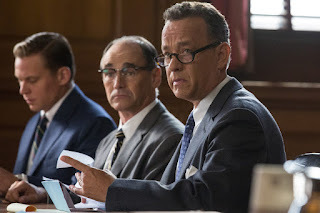 Tom Hanks is James Donovan, a lawyer who's asked to represent Abel in a trial. Donovan and Abel have a fascination relationship in that both men respect each other even if they are both “enemies.” Later, after a US spy plane pilot (played by Austin Stowell) is shot down over enemy territory, Donovan is tasked with making a deal to make a prisoner exchange. “Bridge of Spies” is like two stories in one. The first half largely focuses on Donovan and dealing with representing someone seen as a traitor and enemy of his country. The second half of the film focuses on Donovan as he's forced to go into enemy territory to help facilitate the prisoner exchange, which brims with suspense. Spielberg has easily crafted one of his finest films since 2005's “Munich.” The film has that prestige factor with big stars and its finely crafted period setting, but there's an entertaining air about it and a sense of humor and humanity that surprisingly pervades the film. Credit writers Joel and Ethan Coen for their top notch screenplay contributions to Matt Charman's script, which, like many films made today, is based on a true story. It's also one of those “serious” Spielberg films that isn't pervasively violent for shock value. This is a film you could show in a high school history class without parental objections; and best of all, it's actually entertaining. Trailer for Bridge of Spies on TrailerAddict.